Oblique aerial view of Clashnessie, looking NNE. NC 055 315. A small promontory dun occupies an almost completely isolated pillar of rock on the shore. It is formed by a narrow ruinous wall which borders the rock to enclose an area measuring about 35' by 25'. The entrance is in the SW.
R W Feachem 1963; RCAHMS 1911. 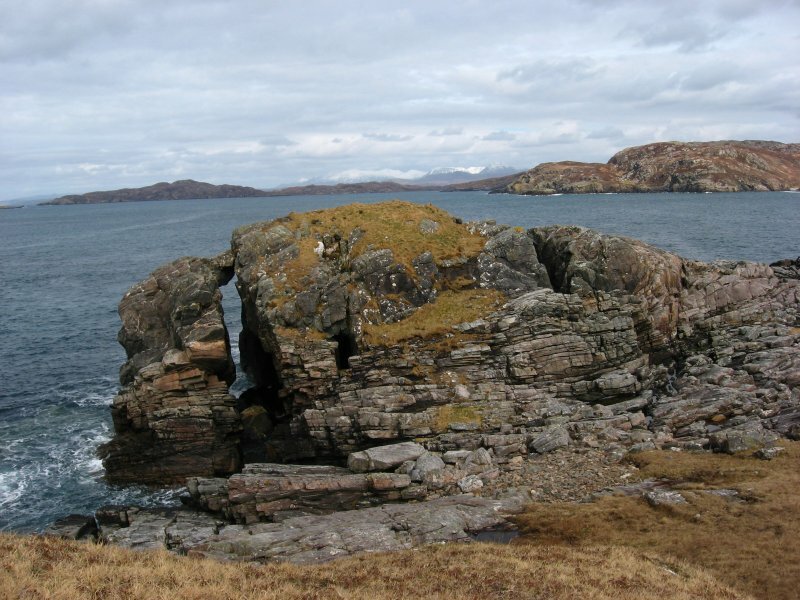 An Dun, Clashnessie: On a prominent flat-topped rock which rises abruptly to a height of some 30' above the shelf that fringes the shore, are the remains of an irregular elliptical structure following to some extent the outline of the rock, and measuring overall 36' x 26'. Only the foundations remain. The entrance has been at the landward end. On either side the rock is cut off by a deep chasm. Information contained in letter from T C Welsh 4 July 1971. NC 0563 3157: Known locally as "An Dun", this oval dun is reduced to its foundation. It survives as a level turf- grown area with the rubble wall core showing occasionally through the turf and in two or three erosion cavities. Traces of the outer face give overall measurements of 13.0m NE-SW by about 11.0m NW-SE. The entrance is not evident. Three metres outside the wall in the SW are the scant remains of an outwork protecting the approach. Visited by OS (A A) 1 August 1974. Visited by OS (J B) 8 August 1980. Clashnessie Dun is situated on an almost detached outcrop of rock some 10m above the sea. To both N and S of the outcrop are narrow vertical clefts down to the sea (C1 & C2) and there are two blowholes running from C1 up through the outcrop at C3 & C4. A narrow neck of rock (C5) links the outcrop to the other side of cleft C1 and immediately to the north of it a section of the cliff wall of the outcrop has fallen away leaving a narrow embayment (C5). To the NE and the SW the outcrop falls away less steeply in a series of steps. On the SE landward side a stretch of beach, just above high water level links it to the mainland. When gales blow from the north however, the outcrop is effectively cut off from the shore and surrounded by crashing waves rising over the tops of the clefts, through the blowholes and over the causeway. The earliest documentary reference to Clashnessie Dun is Roy’s map of Assynt (c 1750) which shows it as inhabited. Roy marks none of the other promontory duns or brochs in Assynt. Home’s map of 1774 marks Clashnessie Dun and Clachtoll Broch but none of the others. 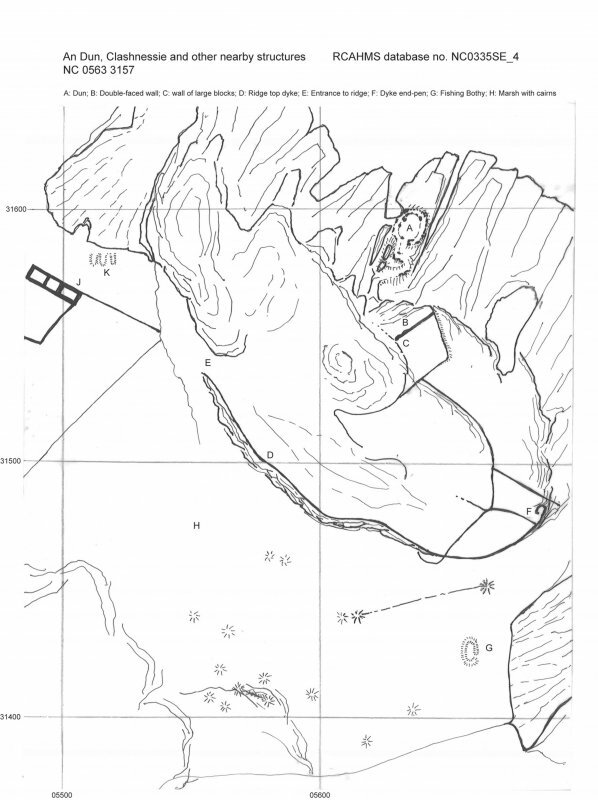 Clashnessie Dun is incorrectly marked on both the 1st and 2nd edition of the OS 6 inch map where it is sited on a small peninsula half a mile NNE. The site was surveyed at 1:50 in order to show the detail of the remains, which are now very fragmentary and difficult to interpret. There are signs of a possible causeway between the shore and the SW corner of the outcrop on which the Dun is built. The outcrop then rises almost vertically for about 2m before a grassy area (P) provides a sloping pathway upwards to the E. The E end of this slope appears to have been revetted (P1) and a fragment of revetment wall may also survive at the W (P2). The slope carries on more steeply over the bedrock (B) but with some convenient ‘steps’ (B1 – B5); possibly enhanced natural recesses. At B5 the bedrock reaches a more level grass ‘forecourt’ (F) bounded to the E and N by upstanding sections of the main outcrop (F1 & F2) and to the W by what may be the remains of a ‘hornwork’ (H) leading up to the main entrance (E). A series of embedded stones (at H1a, b & c) mark the exterior face of H or revetment below it. 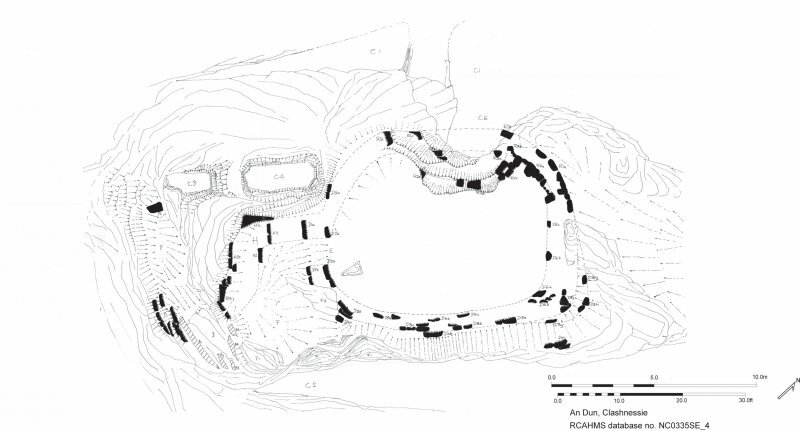 H2 may be part of the inner wall face and H3 of the core as it rises towards the Dun entrance. The outer face on either side of the entrance is visible at D1a & b and the inner face at D2a & b. Sections of the probable outer wall face of the Dun are visible within an embankment at D3a – D3f and in some places where the bedrock dips there are revetted areas (D4a, b & c). It is unclear whether the wall face continues from D3e to D3f or to the lower set D3g, h & j or whether the latter three points are revetment. No sign of the inner face is visible along the SE side although parts of the core show through at D 5a - d. Where the walling turns along the NE side of the outcrop D6a, b & c may be sections of inner wall face. Beyond this area at the N corner the surviving remains are at their most visible, yet very difficult to interpret. Major rebuilding following a cliff fall seems to be the most likely explanation for the features as they currently appear. R1a is a foundation course of seven similar sized stones aligned to create a clear outer face. Running almost parallel, but on a slightly different alignment approximately 1m inwards R2a is a section of walling with the foundation level and up to three courses visible. This might be expected to be the inner wall face, but presents its most regular face outwards. The line of the R1a foundation wall is continued by a large stone (R1b) overhanging the area of suspected cliff fall and carries on across the breach at R1c & d. The line of R2a on the other hand continues to R2b where the smooth curve of the wall breaks up close to the area of cliff fall. Stones R3a & b project out of the sides of the fallen section of cliff and would be roughly on the line of an inner wall face parallel to the projected R1b – R1c fallen outer face. A two course section of wall at R2c, two separate stones at R2d and a protruding stone at R2e seems to suggest walling curving inwards around the area of collapse. It is suggested that the lines R1a, b, c & d and R2a, R2c, d & e represent the original outer and inner faces of the Dun wall and that this wall collapsed when the cliff fell at some unknown date. Subsequently R1a was dismantled down to foundation level and R2a rebuilt as the outer face of a new wall, which then curved inwards around the area of fall through R2c, d & e before rejoining the original wall line at R3d. The walling of R2a is virtually identical in form to what remains of R1a and very similar to other iron age structures in Assynt, suggesting that the rebuilding may have taken place early in the Dun’s history. 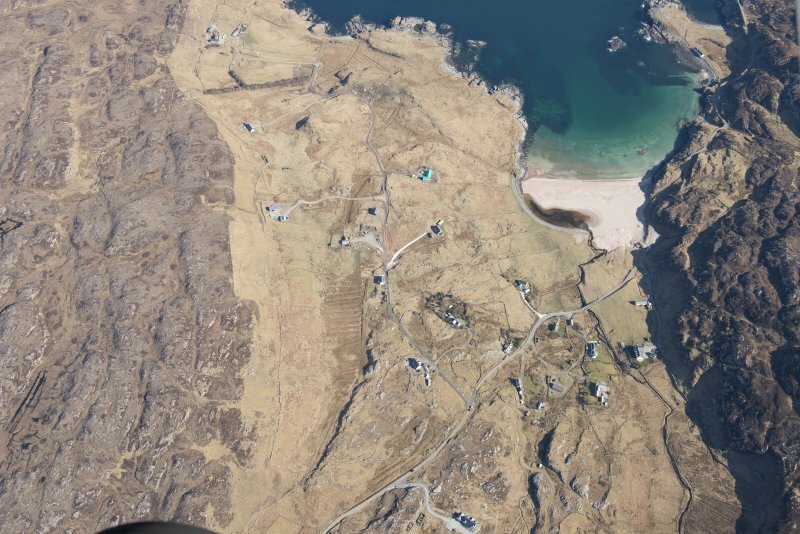 A 200m long and between 60m and 90m wide area of the mainland adjoining the Dun is a little higher than the outcrop on which the Dun stands and is bounded by a steep cliff up to 15m high to the W and S below which is an area of marshy ground between 70m and 100m wide. At either end of the area of higher ground is a small bay. The bay to the NW is below the cliff edge whereas that to the SE slopes gently from the beach towards the Dun. The fragmentary remains of various field dykes can be found throughout this area of which two may be significant. A short stretch of unusually large stones cuts across the slope from the SE bay to the Dun and some fragments of a dyke run along the cliff edge overlooking the marsh and the NW bay. It is tempting to think that the area of high ground was an integral part of the Dun complex and that these two walls may be the remodelled remnants of outworks.